After much anticipation and many spoilers on Instagram, Twitter, Facebook and any other social platform you can think of, I was finally able to visit the Takashi Murakami exhibit at the MCA in Chicago. As soon as I turned onto Chicago Avenue, my excitement was enflamed – light post signs marked with Takashi’s unique artistic style led me directly to my refuge for the afternoon. 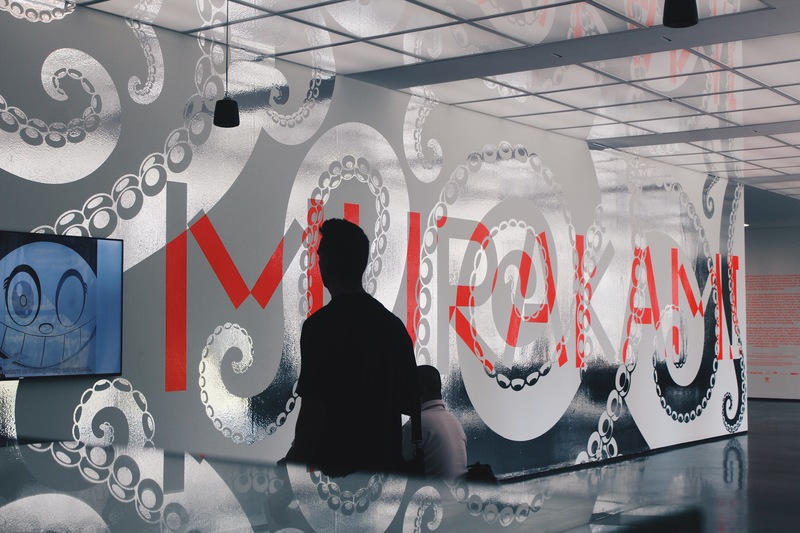 And once I arrived at the Museum of Contemporary Art, there was no mistaking whether I was in the right place – huge banners with the mark of the octopus hung on each side of the museum entrance with a massive greeting smack dab in the middle: The Octopus Eats Its Own Leg, Takashi Murakami. What’s most beautiful about this exhibit, or any art exhibit for that matter, is that one person will have a completely different takeaway from the next. The group of people who explored the exhibit with me stopped to view different portions of the canvas, or spent more time reading different titles and background stories. There’s no doubt that they appreciated different aspects of Murakami’s story. If they were to write this piece, there’d be completely different takeaways. All the more reason for you to visit the exhibition yourself. 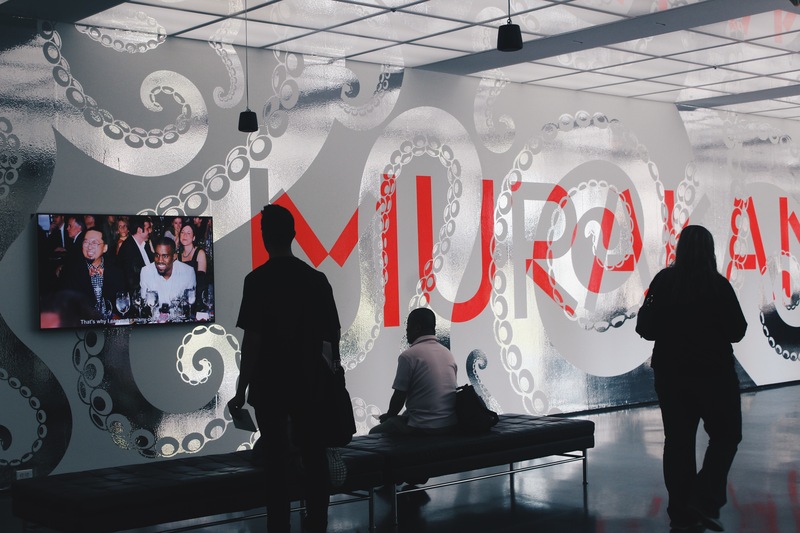 Here are my five biggest takeaways from the Takashi Murakami exhibit, The Octopus Eats Its Own Leg. 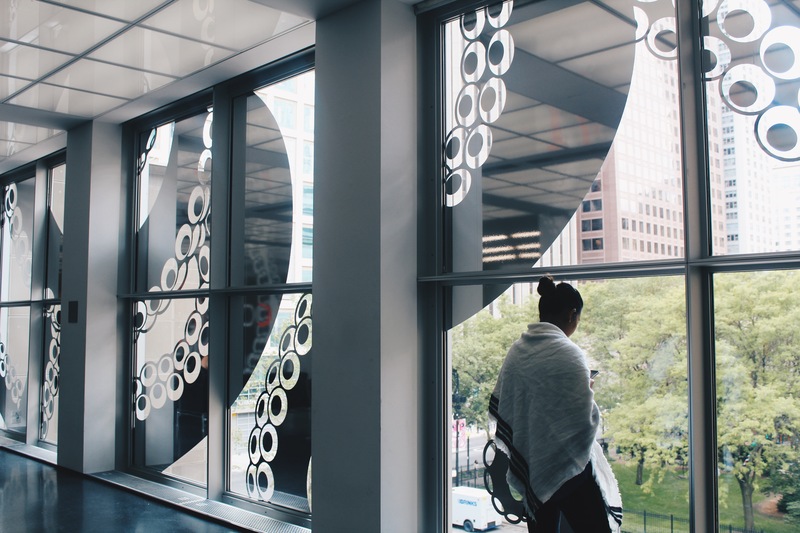 After your visit to the MCA, feel free to comment with your own takeaways! The glo-up doesn’t happen all at once. As noted through his artwork, Takashi experienced (and continues to experience) an evolution. His artistic style consistently developed based on how he was affected by the world’s external forces; however, overall, the themes and characters remained relatively the same. This taught me that expertise and perfection doesn’t happen overnight. To take it a step further, perfection can never be obtained – you may get better at what you’re doing but there’s no finish line. The limit doesn’t exist. Murakami revealed in the exhibit that he originally wanted to be an anime sketch artist. He never became one because he didn’t think he had enough talent.Yes, even the Japanese art legend, Takashi Murakami, experienced self-doubt. This was my biggest takeaway because there are plenty of things that I doubt about myself – from my writing abilities to career opportunities. Everything.And yet, there’s plenty that I’m passionate about that I’m bound to grow to be good at. Murakami found what he was good at throughout the course of the evolution that I discussed previously. He started with traditional Japanese art methods and eventually transformed his existing knowledge and experiences into his own personal style. Eventually anime was on the back burner. Ironically, his art work and use of fictional characters are reminiscent of similar anime artworks. What makes Murakami stand out to me in comparison to other artists is his ability to maintain his child-like imagination. He still imagines entire universes mentally and recreates them physically through doodling. No matter what you venture into – even if its corporate accounting – maintaining the imagination from your childhood is key to remaining true to yourself. The things Murakami imagines, from childhood to now, are the world’s gateway into his thoughts and dreams. As is my writing. Despite his vast artistic abilities, Murakami’s works are never completed alone. He collaborates with entire teams, starting with the first creative draft and ending with the screen prints on canvas.Obvious takeaway: don’t be afraid to ask for help and collaborate with other people. 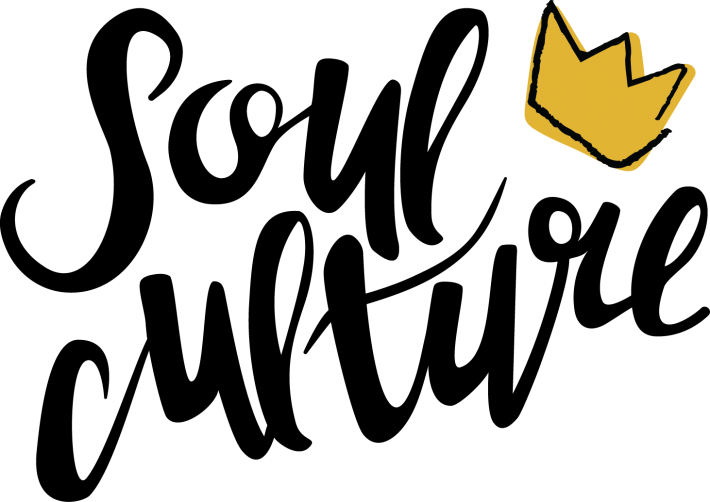 Even world-famous, uber talented artists need an entire team to help produce their masterpieces. 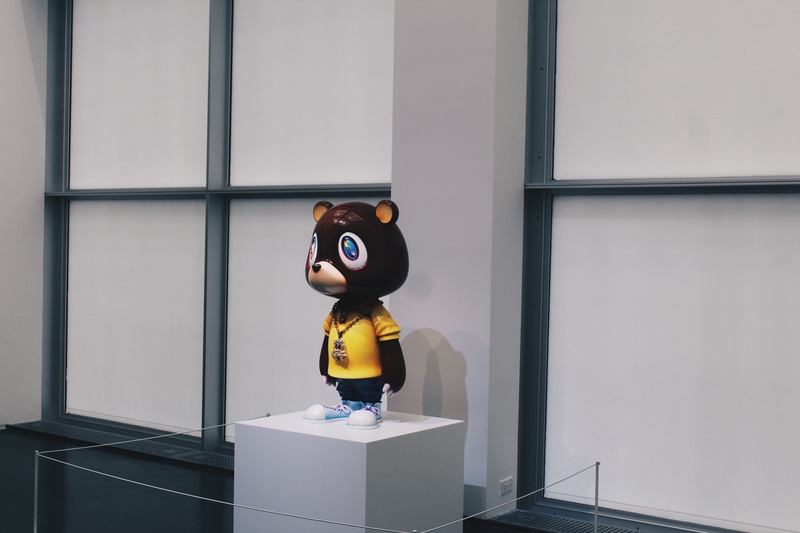 My favorite part of the exhibit, of course, was the room featuring Murakami’s most famous commercial works, including the Kanye West Graduation album and teddy bear character. 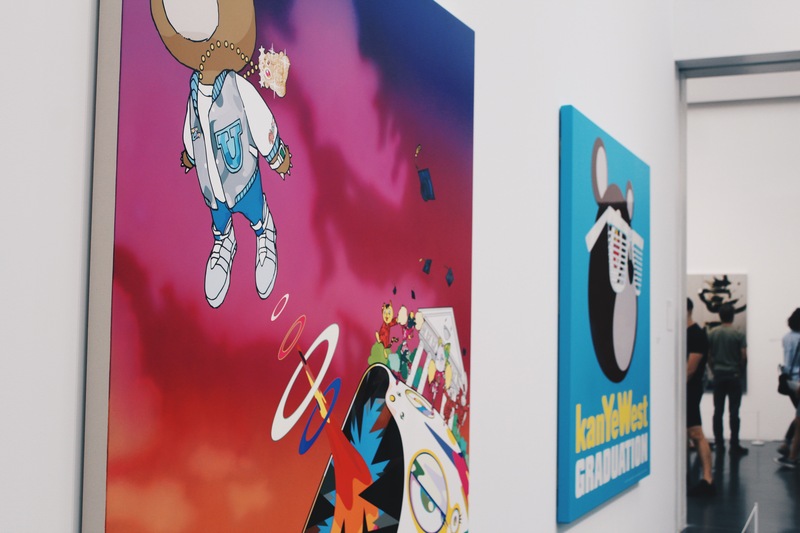 Takashi Murakami has collaborated with some of my favorite artists, including Kanye West and Pharrell Williams. No matter how big the collaboration or how profitable the project, Murakami did not allow his commercial works to define him as an artist.I considered this an important takeaway because as an artist it can be tempting to place the highest priority on monetizing your craft so that it is sustainable. No matter how much money I can make from freelancing, or you can make from designing, painting, singing, or whatever your hustle, don’t lose sight of the things that inspired you creatively in the first place. Murakami continued to challenge himself. 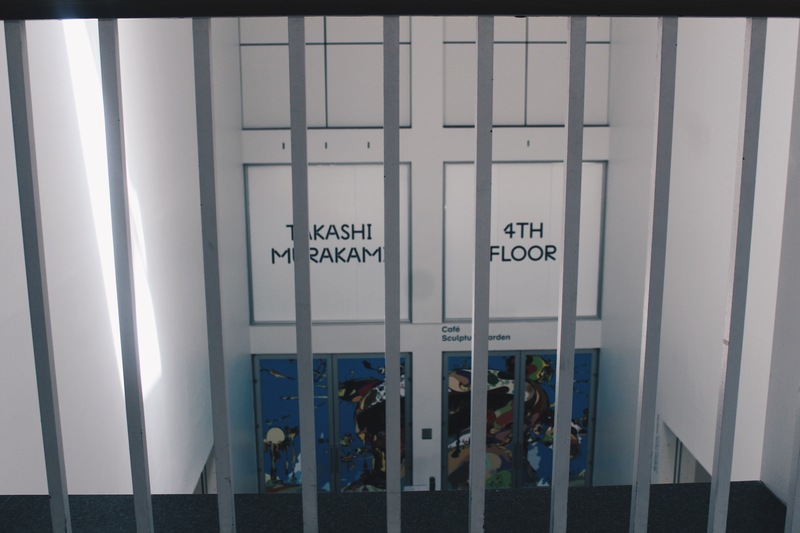 The last room of the exhibit highlighted his most current works where the artist focused on more serious topics – challenging his ability to incorporate external elements into his fictional universe. No matter what your passions are, creative or not, there’s something to be learned from Murakami’s exhibit and life story. 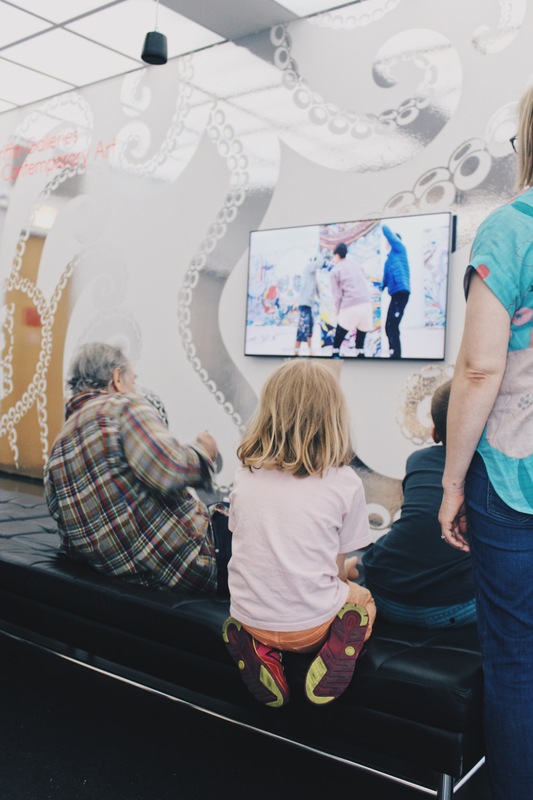 You can visit The Octopus Eats Its Own Leg exhibition by Takashi Murakami at the Museum of Contemporary Art in Chicago until September 24th.